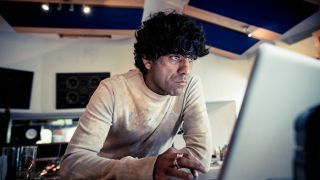 Jagz Kooner is a record producer, remixer and DJ who has been credited with creating some of the most genre defining songs of the last 20 Years. He began his career working with Andrew Weatherall, remixing and producing for the likes of Future Sound Of London, Bjork, New Order and The Chemical Brothers, before forming the seminal band Sabres Of Paradise. He was also a founder member of The Aloof and was responsible for co-writing, producing and mixing the early albums. After the band's demise, Jagz has gone on to produce and remix some of the biggest names in modern music including Primal Scream, Kasabian, Oasis, Killing Joke, Garbage, Massive Attack as well as a host of leftfield artists such as Royal Trux, Ladytron, Deus, The Kills & Soulwax. Jagz Kooner will be hosting a session at the London leg of Producer Sessions Live, which takes place at SAE Institute in London on 7-8 September. This hi-tech music event is brought to you by Future Music and Computer Music and offers tutorial sessions, gear demos and essential advice for up-and-coming producers. A second PSL event will take place at SSR Manchester on 28 September. Ahead of the event we asked Jagz to tell us about his gear, working methods, musical heroes and what he'll be focusing on during his Producer Sessions Live session. "The Studio is in Sheffield. It is a combination of both analogue and digital. It is based around a Mac Pro running Pro Tools HD and Logic Pro, dependent on whether I'm recording bands (Pro Tools) or doing remixes/writing (Logic). "We have an extensive list of analogue equipment including a vast array of vintage synths and drum machines by Roland, Moog, Oberhiem, Dave Smith as well as a collection of vintage organs/pianos by Farfisa, Hammond and Rhodes. "It's a bit of a 'best of both worlds' combination in the sense that we can either mix in the box or run loads of separate outputs to various outboard compressors/EQs and reverbs/delays or use plugins in the box. "The studio, although having the ability to do everything in the box, hasn't actually shrunk as I'm very reluctant to get rid of any equipment even if there are digital emulations of them." "I have various bits of kit that I always turn to, but it always depends on the type of track I'm working on (ie if it's a dance/electronic tune or a full band). "Working on electronic stuff, I will always turn to my Roland Machines (TR909, TR808, Juno 60, Jupiter 8, SH-101) however, with bands it's normally outboard compressors and effects that get used, as the bands normally have all their own equipment. "What piece of kit would I never sell? I'd never sell any of it!" "When I'm writing I always use a combination of Native Instruments and Arturia synths. I'm also a fan of Vacuum (when working in Pro Tools), plus I always turn to Addictive Drums for getting drum ideas worked out or for adding loops/additional beats. It's incredibly quick and always sits like it's always in the mix without having to do any additional processing." "My two main DAWs are Pro Tools and Logic Pro. I use Pro Tools HD to record bands and Logic for writing and remixing. "I find Pro Tools is far better for recording bands as the delay compensation, bussing (for me) seems to be far more stable in recording large track counts of 24 tracks plus. "Logic Pro, however, is incredibly quick for writing and remixing, and the midi is still way ahead of Pro Tools." If you had endless budget, what piece of gear would you love to own? "An endless budget would mean an endless quest for everything! As it stands I could probably do with a few more microphones and a few more decent mic pres. Other than that, I'm pretty much sorted." "When (and if) it happens, I'll let you know!" "I've always been a fan of many producers; Hank Shocklee, Phil Spector, Lee Scratch Perry to name a few. I don't think I've ever tried to sound like any other producer, although I've always been inspired by some of the great producers I've had the privilege of working with, especially Andrew Weatherall, Arthur Baker, Kevin Shields and David Holmes." "I suppose the best advice I've ever been given has been get the job done. By that I mean, get it finished. It's easy to continually keep tweaking tracks and songs but you should always set yourself a deadline to get everything done by and stick to it." "I was once asked to remix one of my all time favourite bands - T Rex. I wasn't going to touch the song or remix it (that would be sacrilege) but I was very intrigued to listen to the separate parts and tracks. I asked the record company to send me the parts before I would agree to remixing it, they unfortunately (but wisely) declined." What will you be showing our readers at Producer Sessions Live? "I've been thinking about this long and hard but have finally decided that I'm going to dissect my mix of The Turning by Oasis. I've picked it as it's a track where I completely rebuilt a new chorus without changing too much from the original version, just to show that it isn't all about throwing loads of electronic parts on a track in order to call it a remix. "I will be showing how the Pro Tools session changed and developed from its original version to the final finished remix I created. Plus, if we have time, I will dissect one of the Kasabian tracks I worked on too."